Exuding elegance, charm, and an Old-World ambiance, the Grand Bohemian Hotel Asheville is a luxurious hotel in the Historic Biltmore Village that offers guests an unforgettable experience. Located just outside the entrance to the Biltmore Estate, the Tudor-inspired Grand Bohemian Hotel Asheville seamlessly blends the grace and charm of a bygone era with modern-day amenities in a fusion of art, music, décor, and luxury. Featuring deluxe accommodations, first-class amenities and services, and gracious hospitality, the Grand Bohemian Hotel Asheville is the signature of a Kessler Collection hotel experience. The Grand Bohemian Hotel offers a selection of beautifully appointed guest rooms and suite, ranging from Standard and Manor House guest rooms to Executive King Rooms and One Bedroom Suites. All rooms and suite feature original artworks, elegant décor and custom-made furnishings, king or queen-size beds in sumptuous linens, and en-suite bathrooms with carved wood and marble vanities, soaking tubs and/or glass-enclosed rain showers, and deluxe bath amenities. Modern amenities abound in every room and include 37” LCD televisions, Bose® CD clock radios, hair dryers, coffee makers, irons and ironing boards, in-room safes, and complimentary wireless Internet. Standard guest rooms feature queen-size pillow-top beds with Matelassé linens and en-suite bathrooms with carved wood and marble vanities, soaking tubs and/or glass-enclosed rain showers, plush terry bathrobes, and deluxe bath amenities. Manor House Guest rooms are located in the Manor House, which is across the street from the main building. These quiet rooms feature queen-size pillow-top beds with Matelassé linens and en-suite bathrooms with carved wood and marble vanities, soaking tubs and/or glass-enclosed rain showers, plush terry bathrobes, and deluxe bath products. In addition to the standard amenities offered at the main hotel, guests staying at the Manor House enjoy complimentary coffee in the mornings and afternoon wine and cheese every Friday and Saturday, which is served on the first floor of the building. Spacious Executive King rooms have ample living rooms and sitting areas with plenty of seating, pull-out sofa beds for extra guests, writing tables and chairs and lovely garden views. 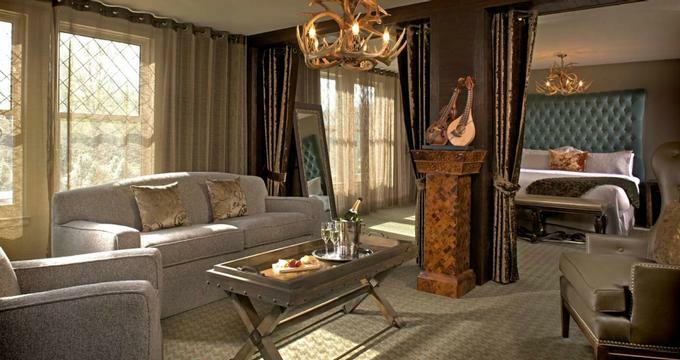 The living room has a second television, custom antler chandeliers and original works of art, and the en-suite bathrooms feature carved wood and marble vanities, soaking tubs and/or glass-enclosed rain showers, plush terry bathrobes, and deluxe bath amenities. One Bedroom Suites are the largest accommodations at the Grand Bohemian Hotel and are ideal for families or guests wanting extra levels of space and privacy. These grand suites feature separate living rooms with pull-out sofa beds for additional guests, intimate dining areas with tables, chairs, and mini-fridges, and other televisions. The king bedrooms have sumptuous king-size beds dressed in Matelassé linens and spacious en-suite bathrooms with carved wood and marble vanities, soaking tubs and/or glass-enclosed rain showers, plush terry bathrobes, and deluxe bath amenities. Some One Bedroom Suites have private balconies which can be requested upon check-in. The award-winning Red Stag Grill at the Grand Bohemian Hotel offers an outstanding fine dining experience. The Red Stag Grill serves contemporary European comfort food in a rustic hunting lodge ambiance, with all cuisine being freshly prepared using locally sourced ingredients and served by professional and friendly staff. The food menu is accompanied by a selection of local and international beers, wines and signature cocktails, which can be enjoyed with dinner or after dinner in the bar and lounge area with live music and other entertainment. The Grand Bohemian Hotel offers an array of first-class amenities and services to enhance every stay, ranging from a complimentary gourmet breakfast served every morning to the exclusive Poseidon Spa, which offers a broad range of relaxing treatments and massages, as well as a 24-hour fitness center. Live music and entertainment can be enjoyed in the lounge and bar area of the Red Stag Grill every evening, and the nearby Historic Biltmore Village is within easy walking distance and offers an array of things to see and do for the whole family. Additional services at the hotel include concierge services, daily newspaper delivery and complimentary parking for guests. The Grand Bohemian Hotel caters for special events and functions such as weddings, receptions, galas and other celebrations. The hotel features over 5,000 square feet of flexible function space, including the 2,200 square foot signature Kessler Ballroom with exquisite crystal chandeliers, elegant marble pedestals, and Grand Bösendorfer piano. The beautifully tented Tyrolean Terrace offers an enchanting space for outdoor cocktail parties, dinners, and events with magnificent mountain views.